Ok, I tried to export a simple process test from Websphere Business Modeler, converting it to .bpmn. Here it the process in Websphere Business Modeler .7. 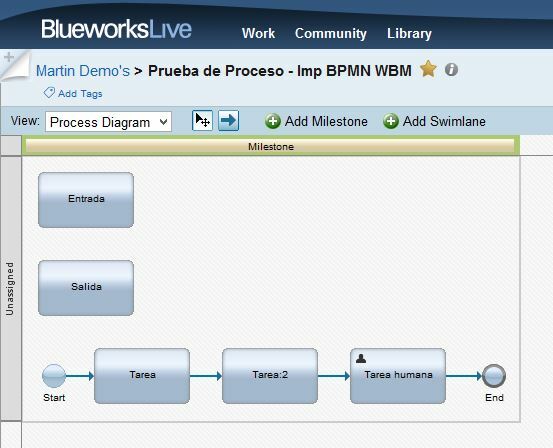 I exported this model in .bpmn and uploaded it to Blueworks Live. Here it is the results. The "Entrada" (Input) and "Salida" (Output) was not converted as I will like to. What about if I export it as XPDL (used by Filenet) and import it to Blueworks Live. Looks better, but I don't know what that "LaunchStep" is. It must be something specific about XPDL format. I will keep trying with more complicated models. 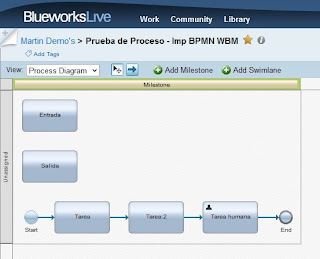 The crime against BPMn that works.